Pet strategy: Roedy says a subset of breaking rules is never taking no for an answer. Photo by Shannon Stapleton/Reuters. 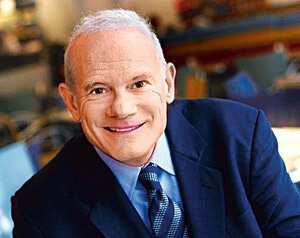 Bill Roedy, 63, the former chairman and chief executive, MTV Networks International (MTVNI), is one of the people who designed and led the expansion of MTV across continents. Under his leadership, MTVNI developed MTV Europe in 1989, brought MTV Asia to India in 1994 and launched other international channels such as Nickelodeon and VH1. Roedy is well-known for setting up a localization model which has been commercially successful, and which allows for enough artistic autonomy. Music is a universal language, yet a business that exists across nations requires some special treatment. How can organizations deal with local idioms and cultures? In addition to us believing that this was the only sustainable way of running this business, it also worked in our favour to have various products around the world because you can take from those areas and make it a vehicle for cultural exchange. And India had so much to offer. I have my own spin of the original phrase “source of influence" as “source of cool". Instead of just importing ideas, you also export—that premise has been the key to our business. In your book, you say that no matter how wonderful your product and business strategy, it doesn’t work unless you have the right people in the right place. What does it take to identify the right man for the right job? 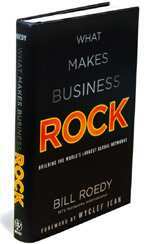 What Makes Business Rock—Building the World’s Largest Global Networks:John Wiley and Sons, Inc.281 pages, $27.95 (around ₹ 1,300). The content at MTV is a balance of centrally produced programming and local flavour. How do you maintain this balance? Well, it’s not as difficult as it seems if you have the right systems in place, including the right people on the ground who know and live the culture. For instance, people who manage the India office are closest to their local culture, so they know the right from the wrong. Then comes in consumer research and the third element would be that anything that’s high production value globally, typically, would work in most markets. You may have to adapt to local languages and contexts. Music is an art and something people are passionate about. While working for such properties, how does one draw the line between being profit-oriented and going all out for the sake of pure music? In the end, any business, including a rock ‘n’ roll channel like MTV, has to attract as many people to watch the channel as possible. Viewership is of primary importance. However, when MTV was solely (about) music, we had a really pure objective of promoting music and the diversity of it. Yet we had to think of ways to involve more people. India is primarily a single TV set market, so we couldn’t focus just on the teenagers, but with Bollywood, we brought in the whole family. Now, we do a lot more programming, even beyond music. That has to do with viewership and successful business. But for most businesses that are selling something closer to human nature than, say, shampoo, your core idea and your business orientation have to be mutually inclusive. Mass media comes with a set of responsibilities, especially a music channel for young people. How can organizations that work in this space deal with sensitive situations? When you address a young audience, by definition it means dealing with irreverence and rebellion. All young people across the world are similar in that way, though different societies can be conservative or liberal in varying degrees. That’s when you have to push the envelope. In the end, it’s a balance of judgement. You have to have credibility and do socially responsible programming. Look at it as an opportunity to deliver the right messages. Your inviolate rule of “breaking all rules" is certainly inspirational and unconventional. How does it actually work and what consequences can it have? Well, for me, breaking the rules is a very important concept. The subset of breaking rules is never accepting no for an answer—and the reason for that is as you develop any business, all sorts of objections and reasons for why you can’t do it will come up. You end up navigating an incredible maze of complexity and negativity. So, I often say, breaking rules is the only way to truly do things.